When we do the grocery shopping for ourselves, there is rarely a standard list of things that we buy. Other than ingredients for our morning smoothies, we mostly buy based on what’s on sale. Even within the smoothie list there is some room for variation, depending on season and sale. Now while ingredients vary from shopping trip to shopping trip, the categories remain the same: fruits and veggies, a couple of proteins- 1 from the land, 1 from the sea, and usually 1 that’s been cured (like sausage or bacon), pasta and/or rice, eggs, wine and beer, bread, milk, yogurt, butter, oils, and CHEESE! I usually have to call on the power of some deity to resist buying all the little cheeses in the bits and pieces bin at Whole Foods. Obviously the above guide to Castejón grocery shopping is not a hard and fast rule. There IS a Bi-lo right down the street that sells perfectly processed and trans-fat-dipped love in the form of frozen tater-tots. So, there’s that. But, for now and for the sake of our culinary reputation, let’s just focus our eyes (and stomachs) in the other direction. During our last proper shopping trip we stumbled across some plump and juicy looking shrimp on sale at our local Whole Foods. 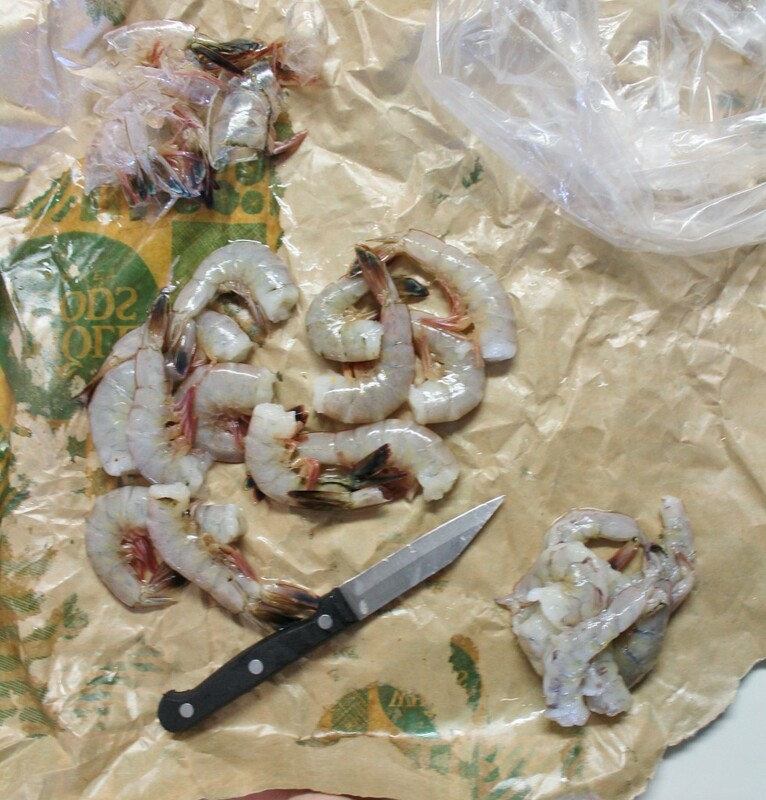 We decided that would be our “from the sea” pick of the week and we snapped up 2 pounds. I was thinking of doing 2 recipes, 1 pound for each- still wasn’t sure of the recipes, though. When Alfonso came home from his night at the restaurant the next day, saying he wanted to practice his risotto skills, the recipe was born. Risotto, no. But, arroz caldoso, sí! Arroz caldoso is Spain’s answer to the popular Italian dish. 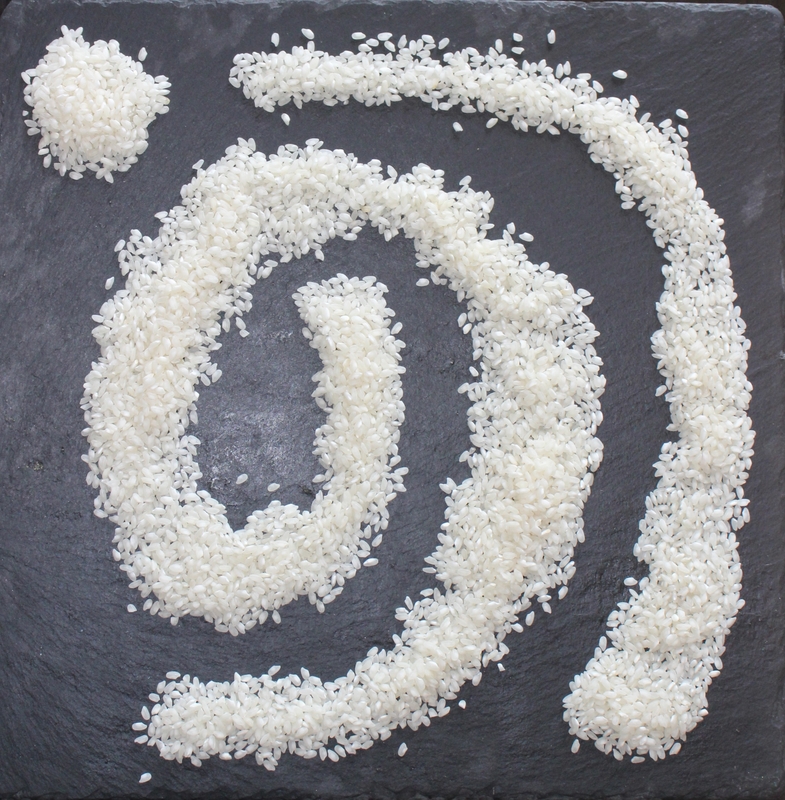 Made of completely cooked rice, in the style of risotto, the chef leaves a fair amount of broth in the pot even after the rice is done cooking. What do you do when you are jonesing to work with rice and you have 2 lbs of shrimp? You make arroz caldoso con gambas! It starts with a dish of broth-y rice, then a topping of a fresh and flavorful mixture of sautéed shrimp, and finished with your big mouth shoveling in spoonful after spoonful. 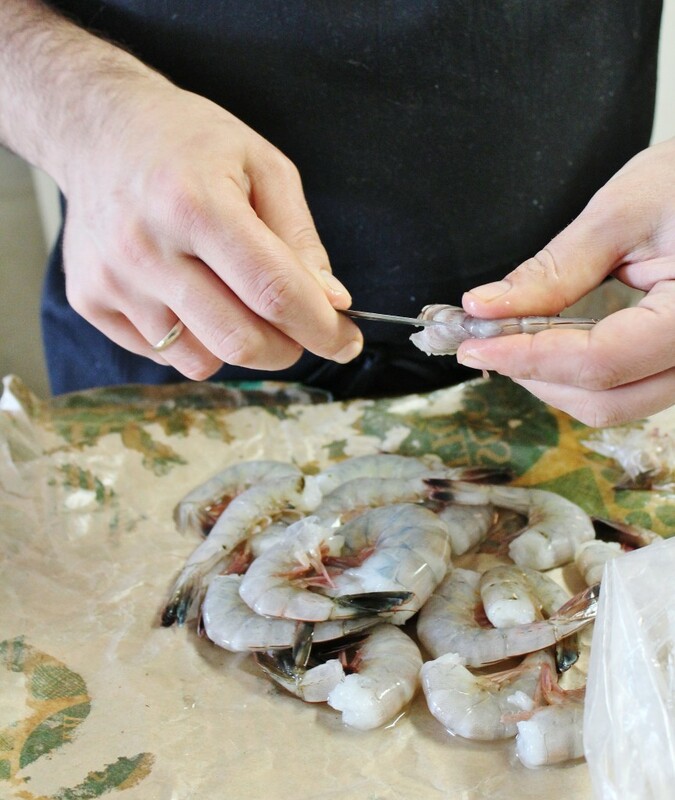 First, prepare the shrimp. They can be set aside later while you make the rice, as they are fine at room temperature. Add a tablespoon of olive oil to a large frying pan. Heat over medium heat and add green onion. Cook until tender, then add half of the garlic. Stir around for about a minute. Add the shrimp, tomatoes, kale, 1.5 t salt, and 1 t pepper. Sauté for a few minutes until the shrimp are cooked through, the kale is wilted, and the tomatoes are soft. Set aside while you prepare the rice. Begin by drizzling 2-3 T olive oil in a large, deep frying pan. Heat over medium-low and add onions. Cook onions low and slow for 10-15 minutes, stirring occasionally while still letting the onions caramelize on the bottom. Add the other half of the garlic and cook for another minute. Add the rice and stir around until coated with the onions and olive oil. Begin adding the broth 1 cup-1.5 cups at a time. When you add more broth stir around for 30 seconds -1 minute and then let cook for a few minutes until the broth begins to evaporate. Each time you add more liquid add about 1/2 t salt. Continue to taste the liquid and adjust salt as you go. Add more broth and repeat the process. Do this until the rice is cooked through, but a good amount of liquid still remains. You should not be able to eat it with a fork, but it should not be soupy either. 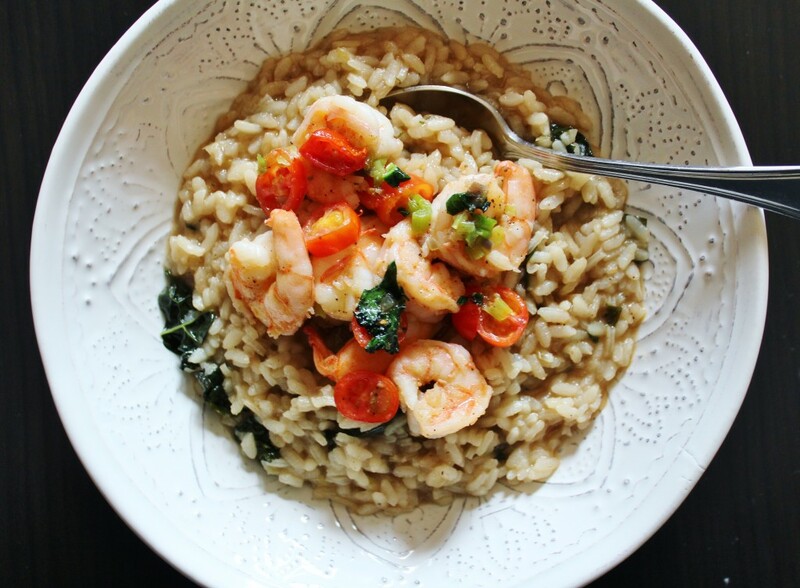 Serve a portion of rice with a portion of the sautéed shrimp over top. Enjoy! 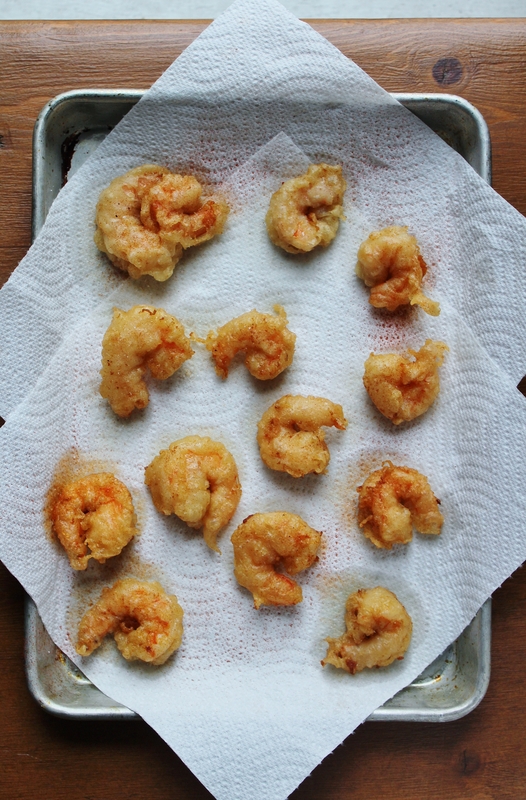 With half of the shrimp left over and having already virtuously cooked the first half in some olive oil straight from Sevilla, it was time to fry something. Don’t tell your new friend Jenny Craig, just do it. 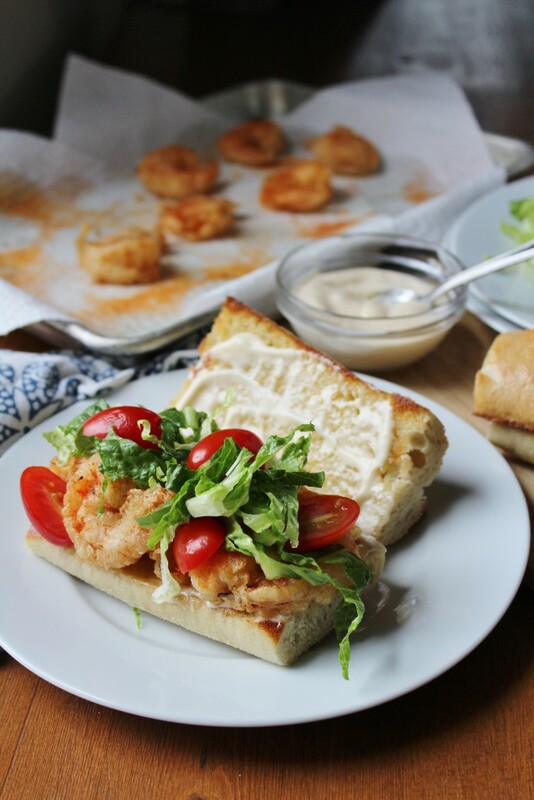 Inspired by the shrimp po-boy from Bay Street Biergarten, we decided to make a beer-battered shrimp bocadillo with aioli and smoked paprika- Spanish flavor meets the Lowcountry, if you will. 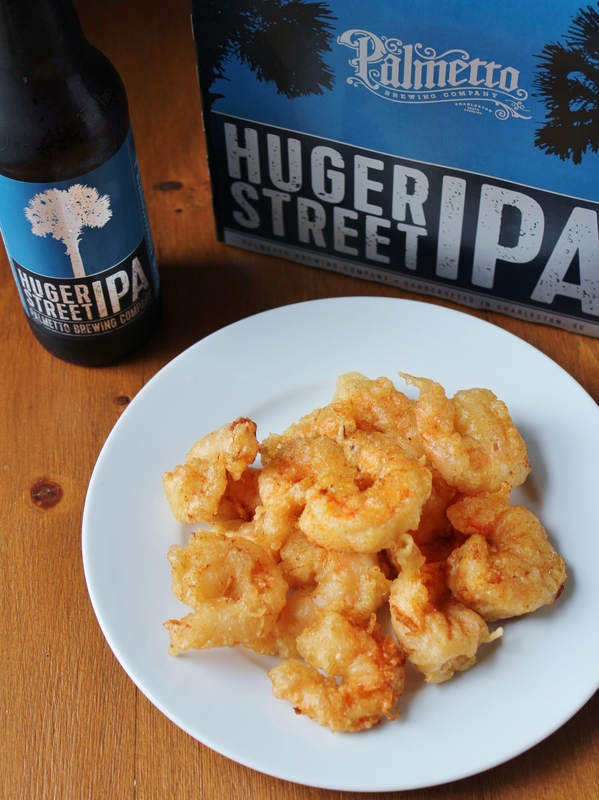 Like always, we had to add in a little local flavor in the form of Palmetto Brewery’s Hugar Street IPA, used to make the beer batter. 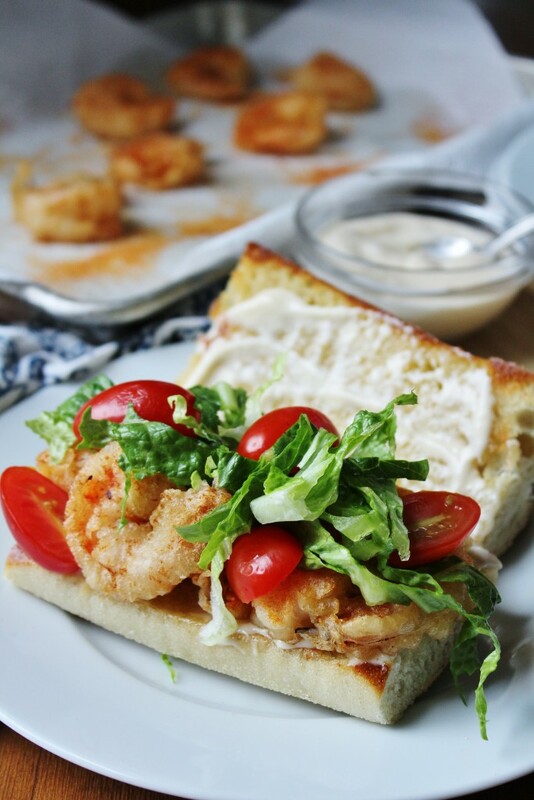 Once you’ve fried the shrimp, the rest of the ingredients can be set out and everyone can assemble their own- who doesn’t love a sandwich buffet? Make sure to lay the fried shrimp out on paper towels to drain the oil before adding to your sammy. Look at those beautiful, crispy shrimp! First prepare the beer batter. Mix all ingredients together until a thick, but still-runny batter forms. Set aside. Heat 6-8 inches of oil in a deep pot over medium heat until you are able to drop a bit of the batter in the oil and watch it sizzle and rise to the top. 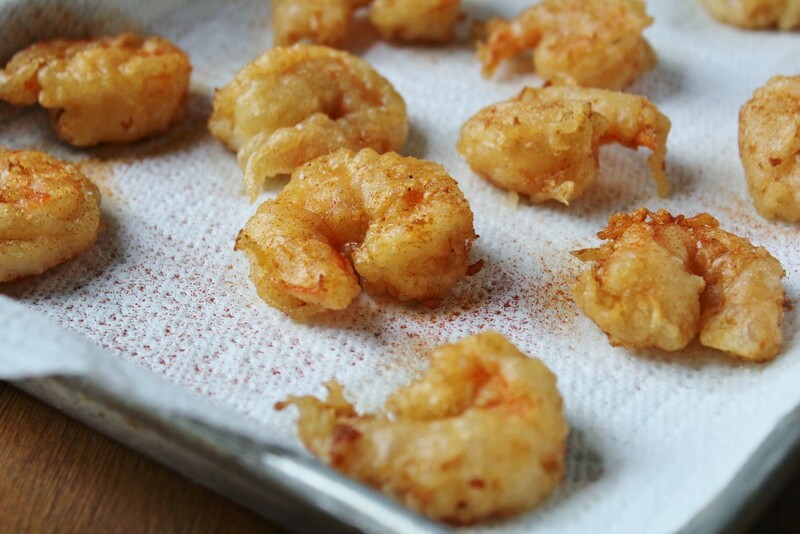 When the oil is ready, dip each shrimp into the batter and then drop directly in the oil (Be careful!). 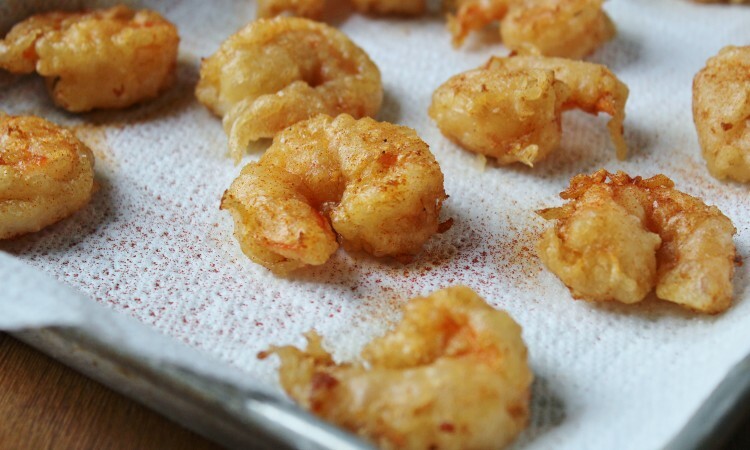 Fry until the shrimp are golden brown. 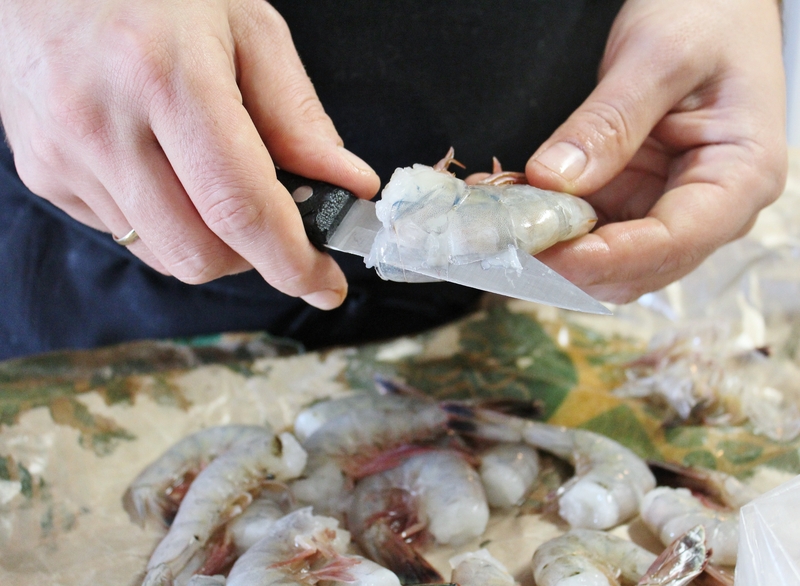 When done, remove with tongs and set aside on paper towels to drain and cool. Meanwhile, prepare the aioli. Crack the egg and add all ingredients except the oil to a large cylindrical cup. Using an immersion blender, begin to beat the egg and add the oil in a a very light, constant stream to the mixture. Continue to run the immersion blender and add oil until the aioli is the consistency of mayonnaise. Set aside in the refrigerator until ready to use. This can also be done with a blender or a food processor. Add butter to a large frying pan and melt over medium heat. Add the bread halves, face down and cook in the butter until toasted. Remove and let cool slightly. To assemble the bocadillo spread a generous amount of aioli on each half of each sandwich. 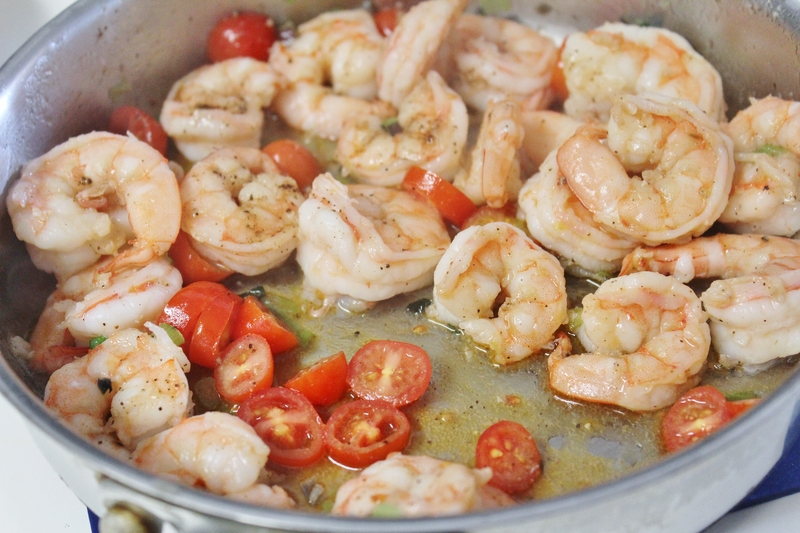 Place 5-6 shrimp on the bottom half and top 1/2 cup lettuce and a few tomato halves. Close the sandwich a chow down. With the warm weather we’ve been having this week, it has made us think of Spring and all the fun projects and adventures we have planned in the coming months. Stay tuned with us here and on social media to see what’s going on with the Castejóns!